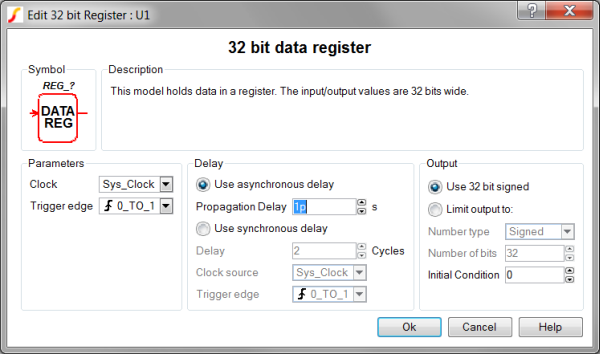 The SystemDesigner Data Register models a clocked digital register. The register can be clocked with any SystemDesigner clock. From the Output parameter box, you can limit the resulting output to either signed or unsigned numbers with fewer than 32 bits. Specifies the global clock used for the Data Register. The Clock can be set up using the SystemDesigner->Edit SystemDesigner Clocks... menu item or by placing a Start of Conversion Breakin. Specifies the global clock used for the Synchronous delay block. The Clock source can be set using the SystemDesigner->Edit SystemDesigner Clocks... menu item or by placing a Start of Conversion Breakin. 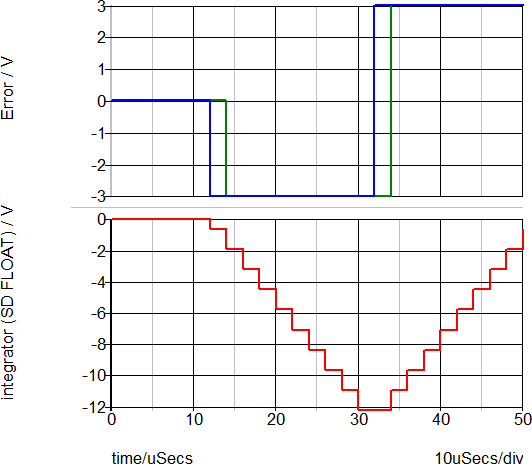 This parameter is used only in models with Synchronous delay. Use 32 bit signed The full 32-bit signed data is output. Limit output to: The output is limited to a Signed or Unsigned number with a designated number of bits. The output will be limited to either a Signed or Unsigned number if Limit output to is selected. This parameter is used only in models with Limit output to selected. Initial condition of the output at time=0. Value is the output bus represented in decimal format. The integrator uses the trapezoidal rule integration method to integrate the incoming error signal. Another register, REG_2, accumulates the result of the previous samples. 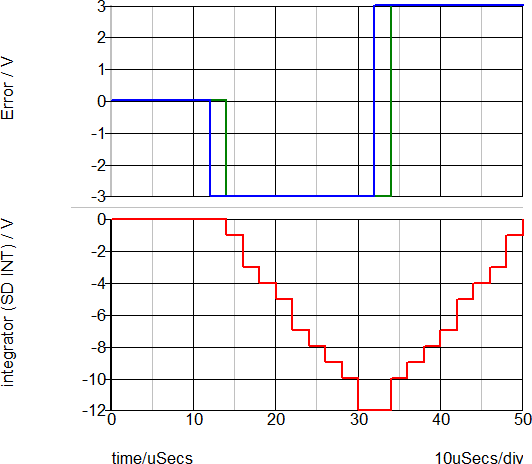 The adder then adds the two analog signals and produces the output: Sum = Error N0 + Error N1. The Sum is then gained by the GAIN_1 block and divided by 2 using the shift right operation, SHIFT_1. Finally, the accumulator implemented with REG_2 and ADDER_3 stores the accumulated results. 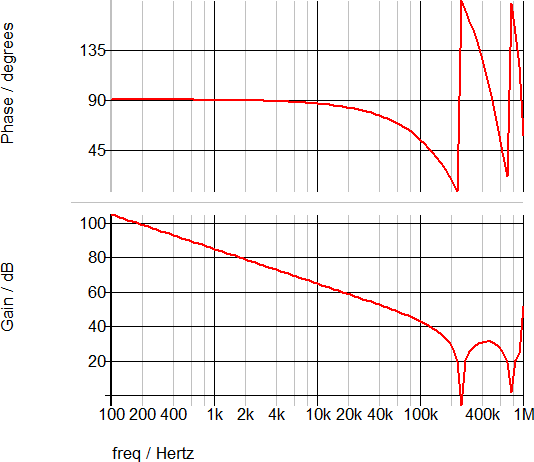 In the floating-point simulation, there is no quantization of the integrated signal. The AC transfer function for the integrator is shown below.